If I asked you to describe port, what would you say? Probably that it is red and you drink it at Christmas. Unless of course, you've visited Porto and Vila Nova de Gaia, the two stunning Portuguese cities that lie either side of the River Duoro, almost touching distance, reflecting their historic, colourful buildings in the water. It is quite simply impossible not to learn about port when you visit here and if you haven't been, this is definitely a city to put at the top of your weekend break list. I visited for the first time in September, for Port Wine Day, and when I was there, I visited the Sandeman "Lodges" or cellars at Vila Nova de Gaia, where tours range from €12 to €40, depending on what ports you taste at the end. It's a good place to visit a bit before lunch, as they have a really nice restaurant, and, as I discovered when I looked around afterwards, they also have a really cool hostel, which has some private rooms, so well worth checking out. The Sandeman cellars, which look out across the river close to the Dom Luis Bridge, have been used for more than two centuries to age port wine in huge oak casks before it is bottled, and as you'd expect, the iconic Sandeman "Don" logo is very much in evidence. 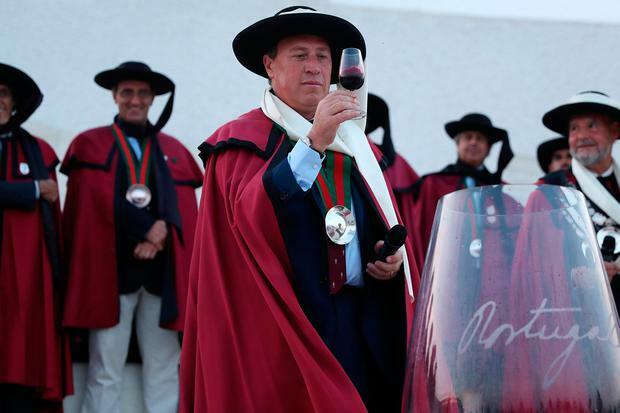 The Don's cape was modelled on the attire worn by university students in Porto, while his wide-brimmed Spanish-style hat reflects the Sandeman family's presence in Jerez. Here, like many of the port houses, they make a few different styles of port - white, tawny and red - and it is interesting to taste the difference between the three styles. White ports can be dry or sweet, but the style that has become increasingly popular is the zesty, dry style which is fantastic as a port tonic, a light alternative to a G&T. The tawny style of port, which is lighter in colour, is allowed to age in old oak and has a more dried fruit and a nutty character, and is beautiful served slightly chilled. And for the red ports, it does get a little bit more complicated as there is ruby, late bottled vintage and vintage, climbing in quality and price accordingly. Vintage port is the one we often hear about, but it is only made in exceptional years. The second spring after harvest, the individual houses make their decision on whether to declare a vintage for their particular port. When more than 10 houses declare the year a vintage, the Confraria do Vinho do Porto, or Port Wine Brotherhood will also declare is as a 'Vintage Confraria'. For 2016, 40 port houses declared their vintage, making it a truly auspicious year. It's a spectacular ceremony (pictured) which sees each house pour a bottle of their port into a giant glass to make a special blend for that vintage. So if you want to mark 2016, this is the vintage to buy. Long ageing in wood has produced a lovely brick colour and complexity of flavour, with evolved aromas of dried fruits, candied peel, figs, dark chocolate and vanilla. Sweet and rich, this tawny port is a bargain and perfect with a tart tatin or cheese. €95, 20pc, from Green Man Wines, Clontarf Wines, Terroirs, Gibney's, Jus de Vine, Kelly's Clontarf, all Dublin; Blake's Fine Wines, Enniskillen; and The Lighthouse, Co. Antrim. With a beautiful nose of violets, wild herbs and a touch of mint, this has a savoury yet concentrated palate of ripe fruit with bramble, blackcurrant, plums and spice. You can drink it now, but best to age for at least 10 years. Lighter in style than a vintage port, ruby port is made for enjoying now. Packed full of red fruit, strawberries and spice, this is made from handpicked Duoro grapes and aged in old oak casks in the Sandeman lodges at Villa Nova de Gaia. Also delicious in a hot port.